the idea of having lamb for dinner may seem like a culinary impossibility if you didn’t spent two years at CIA like my chef, but this was so simple he sat on the sofa and let me do the work! first let me tell you: do not fear the “manager’s special” if you’re going to cook it right away. we got this seven piece rack of lamb at SAMs club for like $11. the tomatoes and onions we already had. we used rice as a side. you can’t beat that price for a two person dinner anywhere (ok, except maybe the cafe at SAMs club. can you believe the hot dog is only $1?! i digress). 2. in a cast iron skillet, render the fatty side first. make sure you get it nice and golden and crisp. this takes about four minutes. 3. flip the lamb around, searing each side for about two or three minutes. 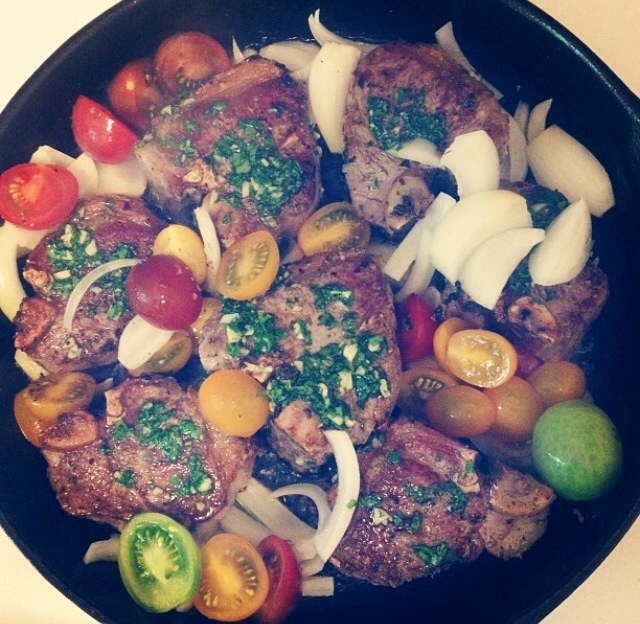 4. throw in your tomatoes and onions and pop the whole thing in the oven for about 8 minutes for medium rare. oh yeah, i also made a quick chimichurri from herbs in my patio garden. this part is totally optional, but chimichurri is super easy and makes you look like you know what you’re doing even if you don’t. i minced some garlic, basil and parsley then added olive oil and stirred it all up real well. smear your mixture on the lamb before you pop it in the oven. anybody have any other good ideas for quick fine dining? Thanks! It was so simple, delicious and easy to cleanup!